- Data obtained from the international network of seismic stations pinpoints the location of the explosion. 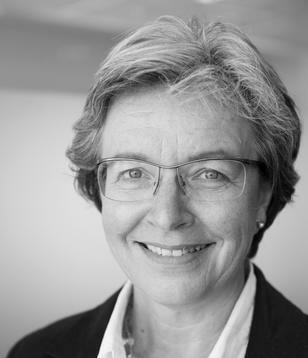 The explosion was carried out in the same mountain structure as the previous two tests, but a few hundred meters further into the mountain, reports CEO Anne Lycke. - This explosion resembled the previous North Korean nuclear tests both in size and characteristics, says Lycke. From the size of the event, indicated by the seismic data, this was clearly a nuclear explosion. From such observations, it is not possible to confirm anything about the type of nuclear device used. Subsequent releases of radioactivity into the atmosphere may help to answer this question. - The explosion has taken place further into the mountain than the previous tests. There is likely to be a greater overburden than previously. There may therefore be a lower likelihood of leakage of radioactivity. Without radioactive leakage, it will be more difficult to determine the kind of weapon that has been tested, says Lycke. There is the possibility that radioactive noble gasses can leak from the site of the explosion. It may take up to 60 days to be able to detect any leakage of noble gasses. The nearest radionuclide statioins in South Korea, Japan, China and eastern Russia. NORSAR estimates the explosive yield to be approximately 10 kiloton equivalent of TNT. This is a comparable size to the bombs that were dropped on Hiroshima and Nagasaki in 1945. NORSAR is responsible for the operation of some of the world’s largest seismic monitoring deployments and has more than 45 years of experience in research and development for monitoring of nuclear tests, advanced seismological data processing, and analysis of data from seismic instruments. NORSAR is the designated National Data Centre (NDC) for Norway for verifying compliance with the Comprehensive Nuclear-Test-Ban Treaty and operates seismic stations located in Hedmark and Finnmark on mainland Norway, Adventdalen on Svalbard and on the island of Jan Mayen, in addition to a radionuclide station at Platåberget on Svalbard and an infrasound station near Bardufoss. The global network consists of 321 stations in 89 countries which ensures that no nuclear tests could be carried out undetected. Seismic signals from each of the four North Korean nuclear tests recorded in Hedmark, Norway, plotted to the same scale. The magnitudes (mb) are based on NORSAR’s recordings and the explosive yield estimates are given in kiloton equivalent of TNT. The seismological observatory NORSAR at Kjeller recorded today, 6 January 2016, 02:40:48 Norwegian time, seismic signals from the reported underground nuclear test in North Korea. This is the fourth in a sequence of tests carried out by North Korea since 2006. The event is estimated by NORSAR to have a magnitude of 4.9. 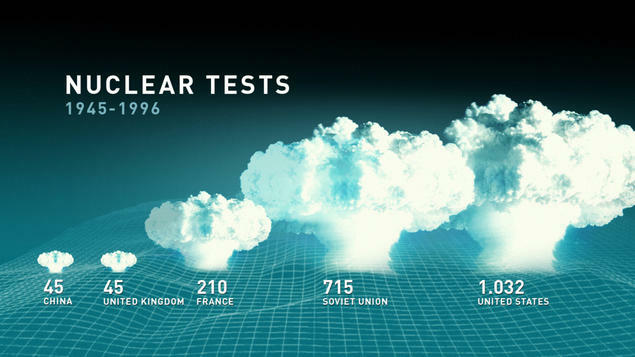 In comparison, the previous North Korean nuclear test which took place on February 12, 2013, a magnitude of 5.0. The first North Korean nuclear test on October 9, 2006, had a magnitude of 4.2.The location is estimated to be 41.28N 129.07E which is in the region where the previous nuclear tests have taken place. This is a distance of approximately 7360 km from NORSAR’s seismic station in Hedmark. 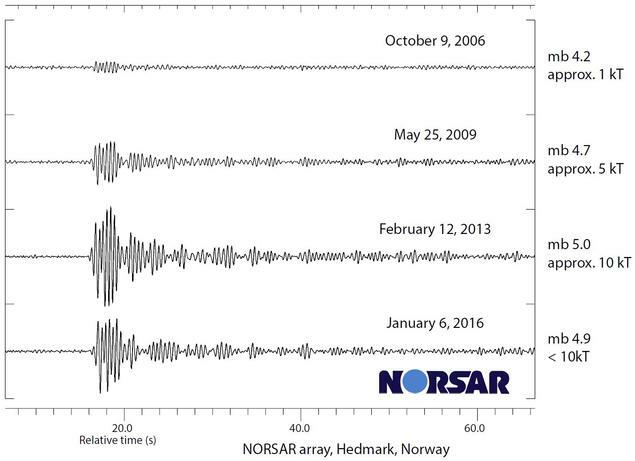 Given that the seismic waves take approximately 11 minutes to propagate from North Korea to Norway, the measurements indicate that the event took place at 02:30 Norwegian time. From the size of the event, indicated by the seismic signals, we can say that this was a nuclear event. It is not possible to tell what kind of nuclear device this was from the seismic signals alone. Future observations of radioactive leakage may be able to address this question. Steven Gibbons is senior scientist at the department of Test Ban Monitoring. He managed to locate the position of the North Korean nuclear test on January 6, 2016.